Our vessels are state of the art Ribs. Chosen for their enviable sea handling and safety records, they are equipped with quiet 250 hp engines, leaving plenty of power spare for smiles. Equipped to exacting safety standards with seating for eleven, you will be carried in comfort, but still open to experience the full drama of the journey. 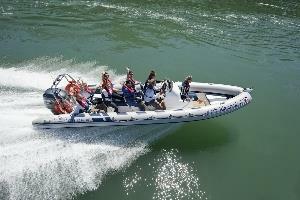 Adventure boat trips on the Menai Strait in safe fast boats visiting wildlife and beaches. Whole boat bookings are £170 for 1 hour, £100 for any subsequent hour up to £570 for a whole day. We sail from a variety of locations in North Wales. Also, due to the local tides, we sail at different times each day. Please contact us for further information on your preferred pick up time and location.